This walk starts at the small village of Cornsay which occupies a quiet spot above the Browney valley on quiet minor roads. It has a pleasant village green with a notable feature which at first glance looks a bit like a medieval gaol. It is in fact called the Well House and was built in 1743. Cornsay is passed on the Southern Hills above Lanchester walk but this walk uses entirely different paths to the south of Cornsay. The route starts at the south of the village street going through South Farm in a south-west direction to reach the road at GR 137427 through a small wood. Here we turn left for a very short distance to then turn into Stow House farm which is now housing. At the end of the second field you turn left to Lodge House Farm and Cowsley Lane, which is crossed and the field path taken to Cowsley. The road is then taken down to the bridge over Cuddy Burn. Here we are at the corner of Hedleyhope Fell which is owned and managed by the Durham Wildlife Trust from their HQ at Rainton Meadows from where they administer 25 reserves. Hedleyhope Fell Nature Reserve is one of the largest examples of mid-altitude heathlands in County Durham. What is special about these mid-altitude sites is the fact that due to their situation between upland moorland and lowland heath they attract plants and animals from both habitats. Over the 20th century they have become quite rare due to the land being used for forestry, mining and agricultural improvement and the few remaining sites became neglected with consequent encroachment from bracken and scrub. Indeed efforts are being made to create new sites on old mining land such as Blackburn Fell near to the Tanfield Railway. The typical plants found are bell heather, common heather, crossed leaf heath and gorse and Hedleyhope has all of these plus areas of rush pasture and a few scattered trees as well as crowberry and bilberry. There are also some rarer species such as adders tongue fern. The fauna is obviously influenced by the plants and consequent food available and has nesting peewit, skylark, snipe, curlew, oystercatcher and short eared owl. I also believe that black grouse can be found here whilst at various times of the year stonechat and long eared owls can be seen. Reptiles found are adder, slow worm and lizard and over twenty species of butterfly have been recorded. Management primarily consists of preventing encroachment from invasive plants which would change its character and eventually lead back to woodland and this is done by selective grazing and some heather burning which ensures a range of heather for grouse. 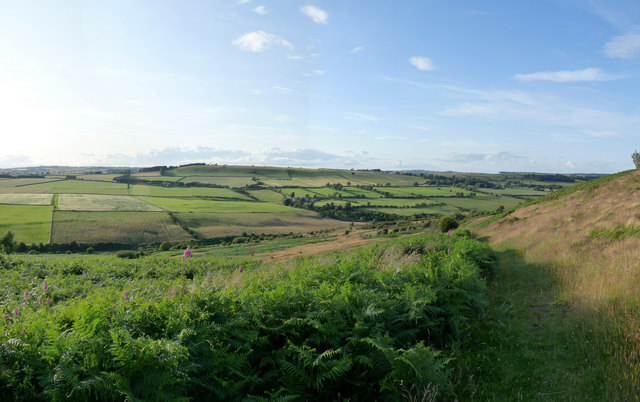 There are several waymarked paths in the Reserve and we take the one along the western edge which gradually climbs up towards Tow Law joining the road at Brick Flats after a distance of over two miles . We now go into Tow Law. This small town was virtually non existent in 1841 when there was only one building but by 1853 there were 2000 inhabitants and this reached its peak in 1881 when the population exceeded 5000. This was almost entirely due to the efforts of Charles Atwood, the Weardale ironmaster. At its peak Tow Law had five blast furnaces, two coking plants and a foundry which made the cannonballs for the Crimean war hence the name of Inkerman for part of the town where the beehive coke ovens are found. We turn right up the main road towards the west although a trip to the south of this street passing the football ground and the back of the cemetery gives lovely views across the Wear Valley over Hamsterley Forest and the Durham moors. The quality of the coal in the north-east varied according to area with the Northumberland section producing good steaming coal and West Durham producing coking coal . This is the reason why coke ovens, both large and small, were found in County Durham. Also found at Tow Law was Ganister, which is a fine grained sandstone, and has furnished refactory material for foundry linings. We take the road to Inkerman Farm, passing the derelict beehive ovens (GR NZ113399) and walk along the road. The land on your right was used for the burial of thousands of animals in the disastrous foot and mouth epidemic at the start of the 2000s. The access track is taken to the left to West Carr and West Shields which was formerly West Broomshields and we then proceed across fields to Broomshiels Hall (note the change in spelling). Broomshiels was shown on the Hatfields Survey of 1375 when it was a separate township divided into parcels which were later absorbed into neighbouring townships. This is a Grade 2 Listed Building and was owned by the Greenwell family for over 400 years. In the grounds is a Roman altar taken from Iveston and in more recent times the hall was the home in the 1950s and 1960s of the Bartrams, who owned the shipyard at Sunderland. 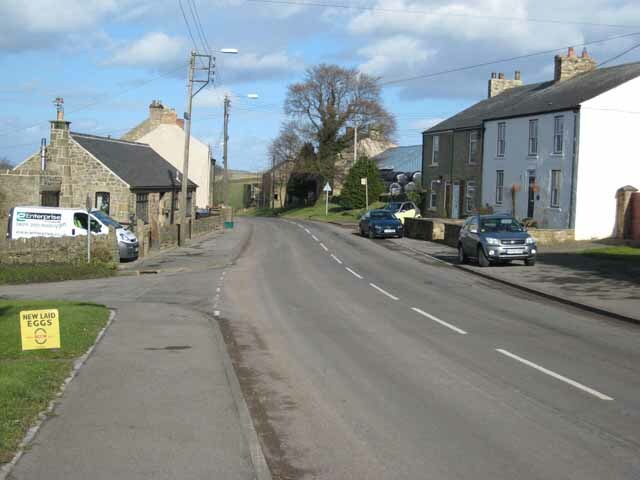 After East Broomshiels we turn left into Satley which is an old settlement from Anglo Saxon times (11th to 12th century). There is evidence that the settlement went back much earlier, as arrowheads etc. have been found although strangely there are no signs of Roman settlement even though Lanchester fort was close by. The church is Victorian, dating back to when Satley became separate from Lanchester and medieval stone in the west wall of the church suggests that there was probaly a chapel here before that. We take the clear track to the right after the pub which heads east and later north following the Pan Burn which is crossed by a footbridge. The footpath then enters a wood before ascending across a field and continuing climbing alongside a field boundary to reach the road just outside Cornsay. This entry was posted on Monday, October 29th, 2012 at 4:21 pm	and is filed under Other. My wife and I did the Hedleyhope Fell & Satley walk yesterday. It was an excellent ramble – all paths were there and navigation easy. Interesting industrial archaeology and v impressed with Hedleyhope Fell.